Everest Base Camp at 5,364 m(17,598 ft) is one of the most famous trekking routes in the Himalayas and the world. 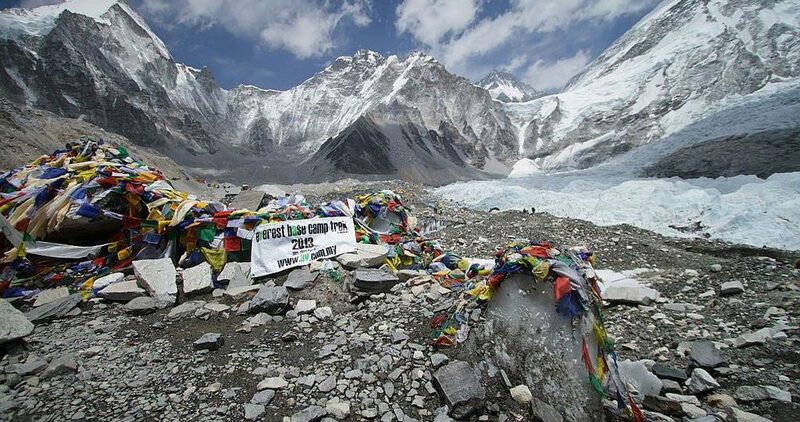 Thousands of trekkers from all over the world trek to Everest Base Camp each year. Everest Base Camp is a dream for most mountaineers. 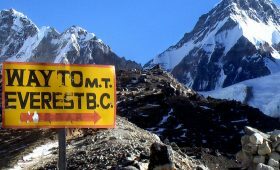 There are generally two routes to trek Everest Base Camp. One is the longer version and the other the shorter 8-day version. The 8-day Everest Base Camp is perfect for trekkers with a limited time schedule. The starting point of this trek is Lukla, and to get to Lukla you can take a flight from Kathmandu. It is a scenic 30 minutes flight. From Lukla, you will trek upwards to Namche following the Dudh Koshi River. The trek then takes you to Dingboche and finally to Everest Base Camp via Gorak Shep and many other beautiful Sherpa Villages. 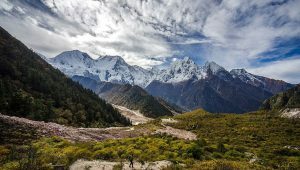 This trek is a perfect combination of scenic beauty and unique tradition of the Sherpa people. The views on the trail are to die for. The Himalayan ranges surrounding the region and amazing views of the Everest will make this trek worth it. The trek also leads you across different Sherpa villages with its own different character. You will get a chance to experience their culture and traditions first hand and learn a few things about it. The mountain life and ancient culture you will see during this trek will be something you will forever remember. 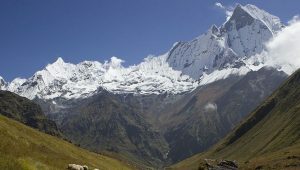 The Sagarmatha National Park is one of the highlights of this trek. 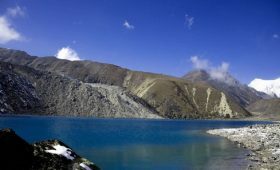 This National Park is a World Heritage site by the UNESCO and is also Nepal’s very first National Park. It lies next to the Qomolangma National Nature Preserve of Tibet in the north and the Dudh Koshi River in the south. It is abundantly rich in flora and fauna. And you will also find some rare species of animals like Himalayan Tahr, Musk deer, Ghoral, Snow leopards, Lynx etc. There are also about 1000 plus rare to endangered species of birds found here. This place is a real treat for avid bird watchers. Another highlight of this trek is the one of a kind helicopter ride from Gorak Shep to Lukla at the end of the trek. It is a strenuous grade trek and requires you to be physically fit and mentally strong. Other than this, you do not need any previous trekking experience or trekking techniques although it is a plus point. This short trek will provide you with a great sense of achievement and the best views possible. Enjoy a scenic 30 minutes mountain flight to Lukla. Experience the unique culture, tradition, and hospitality of the Sherpa people. 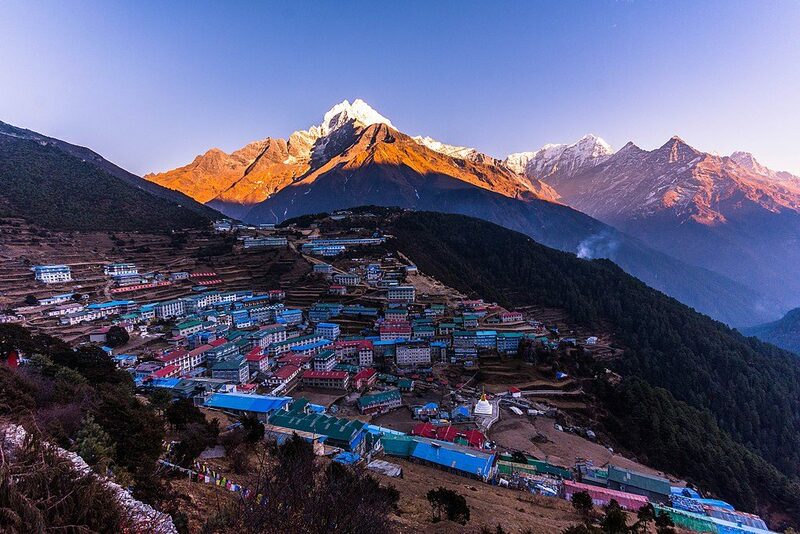 Explore the biggest village of the Khumbu Region, Namche Bazaar. Visit the Sherpa museum and discover their amazing culture and traditions. Stunning views of Mt. Everest, Lhotse, Nuptse, and Amadablam many others. Hike on the Khumbu glacier and see the Khumbu icefall. Exceptional mountains, glaciers and several rare species of animals and flowers. Ancient monastery in Tengboche, the largest monastery in the entire Khumbu Region. Helicopter ride from Gorak Shep to Lukla. Everest Base Camp, the base camp of the world’s highest mountain. After a scenic 45 minutes flight from Kathmandu to Lukla, the gateway of the Everest Region, you will finally begin your trek. The trek will begin with perfect views of the mountains like Karyolung, Nupla and Gongla. And following the Dudh Koshi river and crossing some suspension bridges, you will finally reach Phakding. After breakfast, you will start your trek by a gradual walk and cross the Dudh Koshi river via a suspension bridge. After some hiking, you will reach Monjo village and then Sagarmatha National Park, where you will have to show your entry card or buy one to continue. From here the trail will continue with few ascents and descents finally reaching Jorsalle. The trail then continues uphill and you will cross the famous Hillary Suspension Bridge. The last 2 hours of the trail is a challenging steep climb through dense forests before reaching Namche Bazaar. Today you will have a rest day/acclimatization day. You can hike to higher altitudes today to help your body get used to it. Hike to Khumjung and visit the local school and hospital, trek to Thame, Syangboche are some hiking options. Also, you can take the uphill to Everest View Hotel and enjoy the magnificent majestic mountains. After that, you can either rest or take a stroll around Namche and shop for souvenirs in the market. After breakfast, you will start your trek to Tengboche. With only half the elevation gain compared to the first day, today’s trek will be an easy one. You will pass through several small stupas on the way. 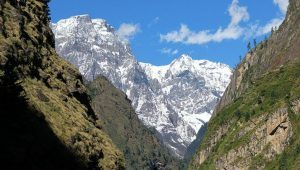 About midway of the trail, you will come across a crossway with a sigh pointed towards Khumjung in one direction, Gokyo and Tengboche in the others. 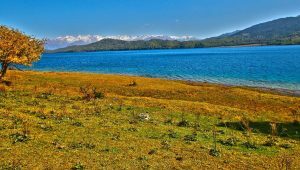 The trail will also take you across rhododendron and pine forests and if you are lucky you might even get a chance to spot animals such as Musk deer or Thar. Today’s trek will offer you amazing views of the mountains like the Nuptse, Lhotse and Ama Dablam. Tengboche also offers you the very first sight of the mighty Everest. 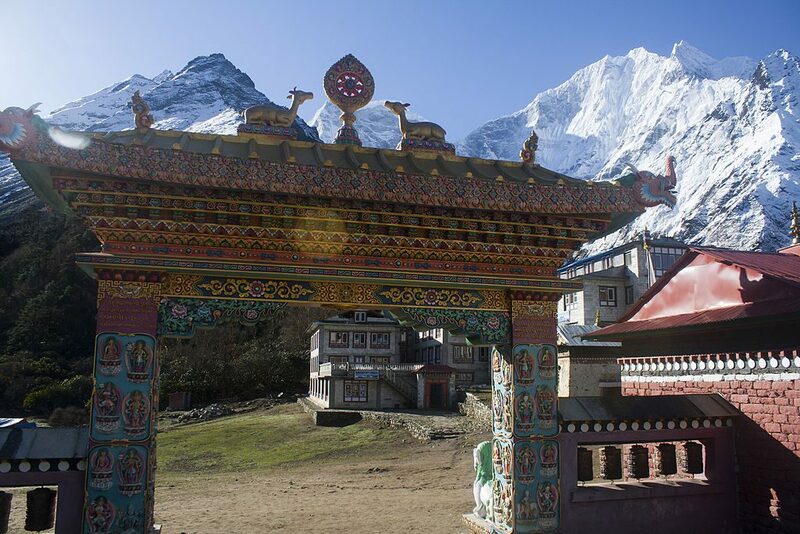 You can also visit the Tengboche Monastery, which is the biggest monastery in the Khumbu Region. After breakfast, you will start your trek with a slow descent through rhododendron forest following the Dudh Koshi river. You will cross an iron bridge and hike upwards to reach the Pangboche. You will also be entering the Imja Khola Valley and climbing a steep trail to finally reach Dingboche. Today’s trek will offer you an amazing closeup view of Ama Dablam. And views of other mountains such as Lhotse, Imjatse, Taboche. After breakfast, the trek will start with a gradual hike for about 2 hours to reach Thukla. From here you will set off on the steepest part of today’s trek, the ascent to Dughla Pass at 4,830 m.
Once you reach the top of the Dughla Pass you will see a memorial park for all the people who’ve lost their lives climbing the Everest. The trail then continues into the Glacial Moraine, a barren landscape with some lakes. You will also get your first glimpse of the Kala Patthar from here. After walking for a while, you will finally reach Lobuche. It is a beautiful village which offers some of the most spectacular mountain views. Finally, it is the day to trek to Everest Base Camp. After an early breakfast, you will start your trek to Gorak Shep village, the last settlement before the Everest Base Camp. 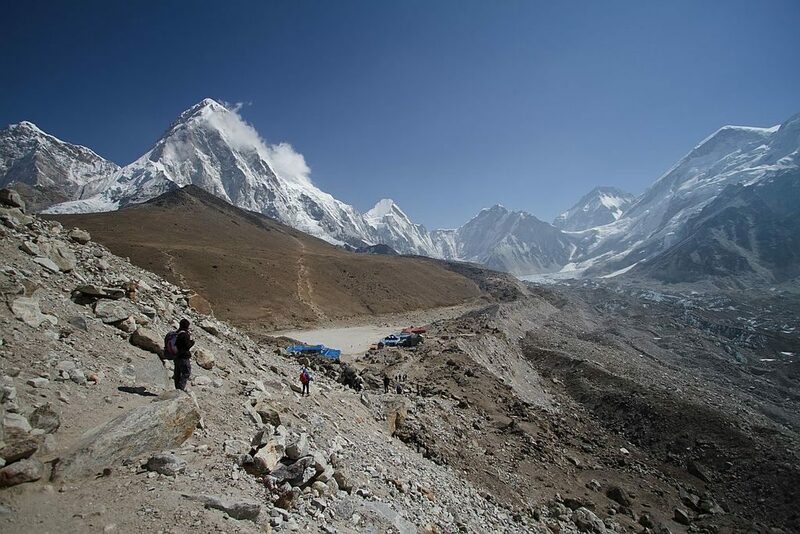 You will trek for about 3 hours along the Khumbu Glacier and mountains to reach Gorak Shep. From here, you will trek for another 5 hours through trails going uphill and downhill to finally reach the Everest Base Camp. Everest Base Camp is the nearest one can get to the majestic Everest without climbing it. You will also get amazing views of the Nuptse, Khumbutse, and Pumori from here. You can enjoy the view and then head back to Gorak Shep, from where you will take a helicopter ride to Lukla. This helicopter will be one of a kind ride in the highest altitude with amazing views below. Today is the last day of your trek to Everest Base Camp, after breakfast, you will take a flight from Lukla to Kathmandu. But we hope you have had the best and the most memorable time with us. We hope to serve you again for many more exciting adventures in the mountains like this. QNo. 1. When is the best time to trek Everest Base Camp? Best season for Everest Base Camp Trek is Spring(March, April, May) and Autumn (September, October, November). These months are the peak season for trekking in Nepal. QNo. 2 What permits should one get for this trek? This is the permit that has replaced the TIMS( trekkers information management system) card. This card is available at Lukla and will cost you USD 20 per person. This permit is a must for anyone trekking in the Everest Region. You can get this at the National Tourism Board at Kathmandu or at the National Park Entrance at Monjo. This permit will cost you USD 34 per person. Trekking to the Base Camp of the highest mountain of the world is a trekkers dream and you too can do this trek even with a limited time frame. It might be a short trek, but it is a rewarding trek with mesmerizing views of the Everest along with other mountains. The scenery of the Everest Region along the trail will leave you wanting for more. The peace and solidarity you will experience here are absolutely blissful. 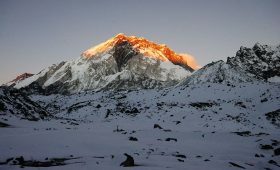 So, if you do not have enough time for the ideal Everest Base Camp Trek, this 8 days trek is the best. This will be one of the best treks that will stay with you forever. For further details please feel free to contact us. We are more than happy to help you.